Offensive guard Justin Pugh (knee) and offensive lineman Brett Jones (calf) have officially been ruled out of Sunday’s game against the Chicago Bears. There is no press availability to the team on Saturday. 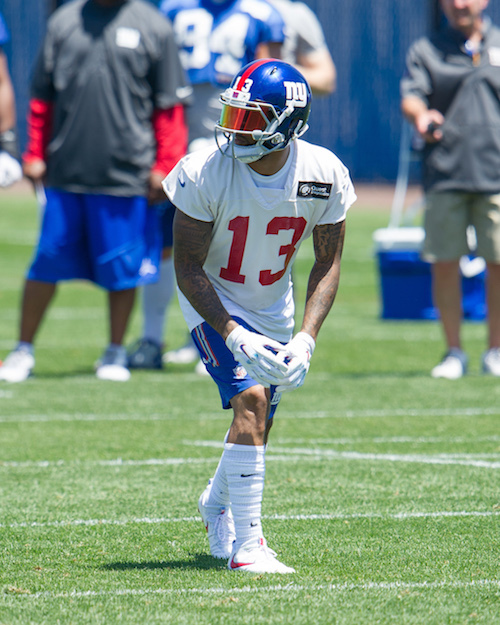 The Giants play the Chicago Bears at MetLife Stadium on Sunday at 1:00PM ET. 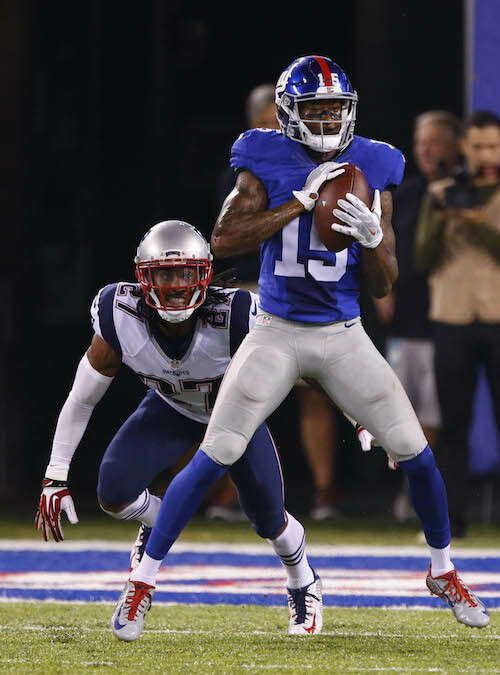 Minus many of their best offensive and defensive players, the New York Giants defeated the New England Patriots in the preseason finale Thursday night at MetLife Stadium in East Rutherford, New Jersey. The Giants finished the preseason with a 2-2 record. 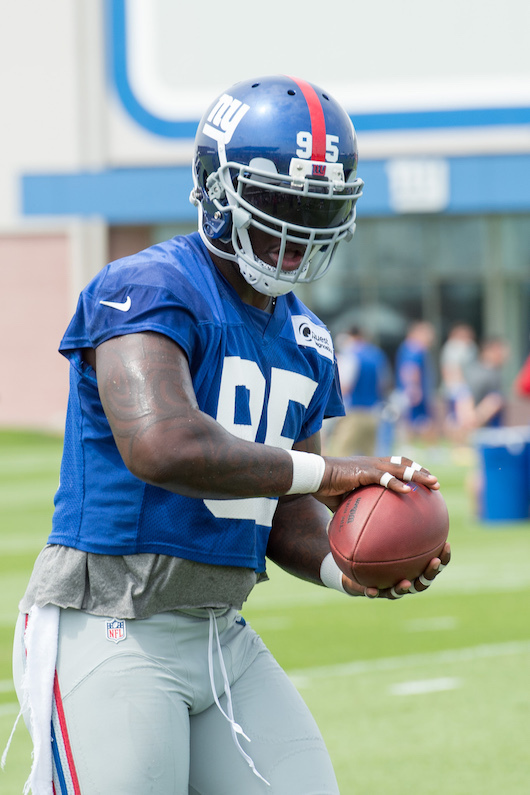 Head Coach Ben McAdoo decided to sit quarterback Eli Manning, wide receiver Odell Beckham, center Weston Richburg, defensive ends Jason Pierre-Paul and Vernon Olivier, defensive tackles Damon Harrison and Johnathan Hanks, and cornerbacks Janoris Jenkins and Dominique Rodgers-Cromartie. Offensive tackle Will Beatty and place kicker Josh Brown suited up but did not play. On the other hand, Patriots quarterback Tom Brady played the entire first half against mostly a second- and third-team defense that performed admirably well. In six first-half Patriots drives, the Giants forced three turnovers and allowed only one scoring drive: a 9-play, 67-yard effort that ended with a 7-yard touchdown pass by Brady. The 2-point conversion attempt failed. New England’s first drive ended when cornerback Trevin Wade stepped in front of Brady’s intended receiver for the interception. Later in the 1st quarter, safety Andrew Adams forced ex-Giants tight end Martellus Bennett to fumble. Defensive tackle Montori Hughes recovered the loose ball. 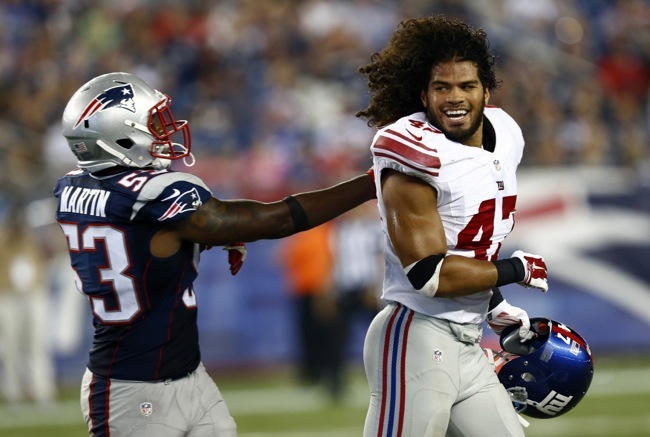 The Patriots drove deep into Giants territory in the 2nd quarter, but defensive end Kerry Wynn forced the running back to fumble after a short reception with linebacker Mark Herzlich recovering at the Giants 8-yard line. Quarterback Ryan Nassib started and played into the 4th quarter before giving way to Logan Thomas. Nassib struggled again for the most part, completing 16-of-29 passes for 210 yards, one touchdown, and one interception. Out of their seven first-half possessions, the Giants had two long drives: one 15-play, 59-yard possession that ended with a 25-yard field goal by place kicker Randy Bullock; and the second a 6-play, 63-yard possession that ended with an interception at the Patriots 2-yard line with seven seconds left in the half. At the break, the Patriots led 6-3. 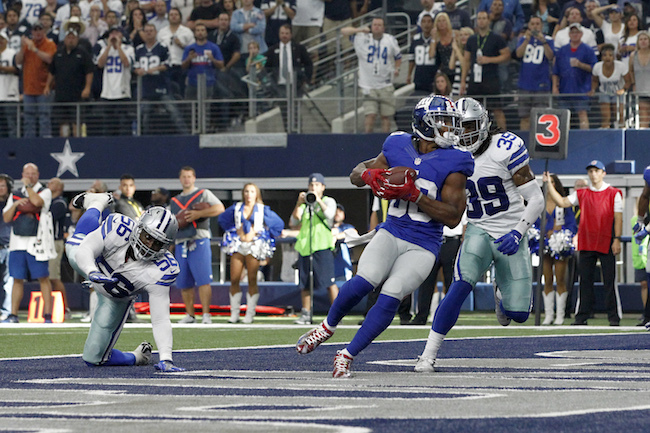 The Giants defensive reserves remained stingy in the second half, allowing only one scoring drive: a 16-play, 66-yard march that resulted in a 32-yard field goal. Meanwhile, the Giants offense scored two touchdowns. 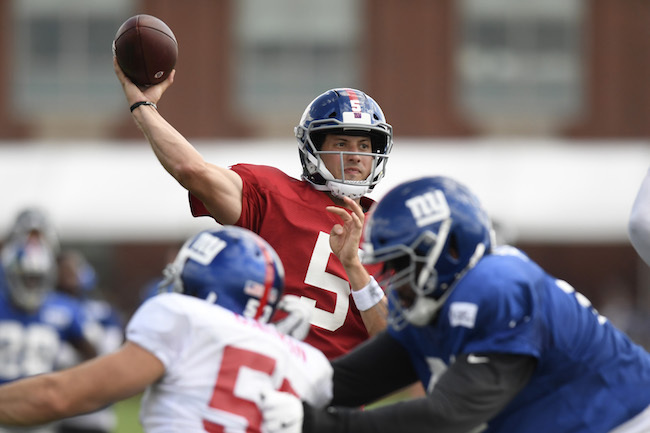 On the team’s first possession of the second half, Nassib connected with wide receiver Tavarres King on a 59-yard catch-and-run for a go-ahead touchdown. The next two Giants drives only each picked up one first down. 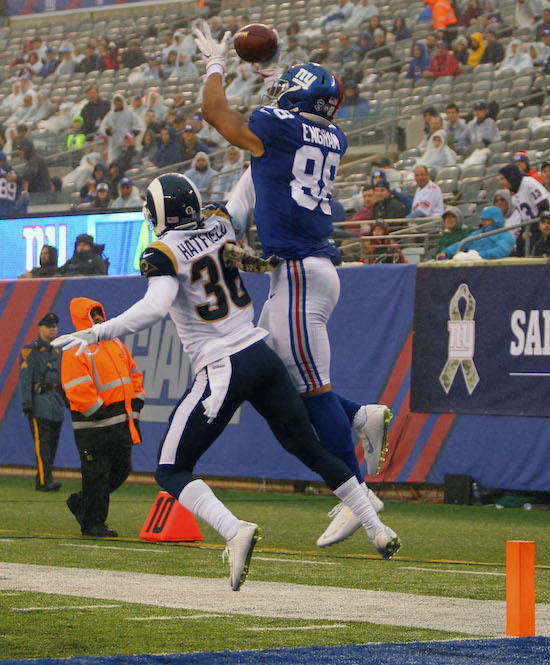 But in the 4th quarter, with Thomas at quarterback, the Giants drove 79 yards in 13 plays with the final snap being a 17-yard touchdown pass to wide receiver Roger Lewis with 3:49 to go in the game. Offensively, the leading rushers for the Giants were Bobby Rainey (7 carries for 38 yards), Orleans Darkwa (9 carries for 37 yards), and Andre Williams (10 carries for 35 yards). Paul Perkins fumbled the ball away. The leading receivers were King (4 catches for 80 yards and a touchdown), Rainey (3 catches for 37 yards), Lewis (3 catches for 30 yards and a touchdown), Geremy Davis (3 catches for 30 yards), and Perkins (3 catches for 29 yards). 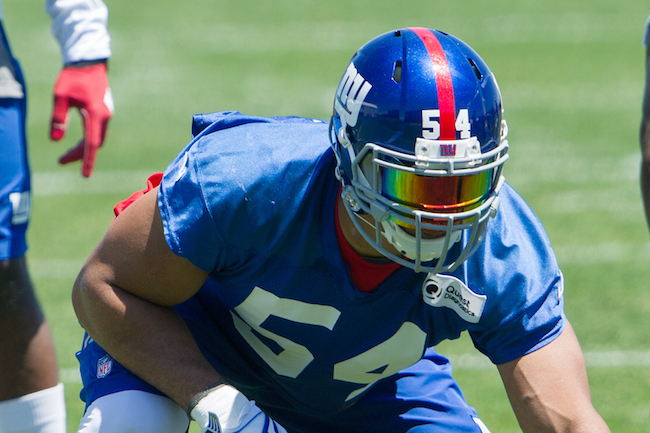 Defensively, linebacker Mark Herzlich had 8 tackles, 1 sack, 1 tackle for a loss, and 1 fumble recovery. Defensive tackle Montori Hughes had a sack and a fumble recovery. Defensive ends Stansly Maponga and Romeo Okwara each had sacks too. Defensive end Kerry Wynn and safety Andrew Adams forced fumbles. Cornerback Trevin Wade had an interception. 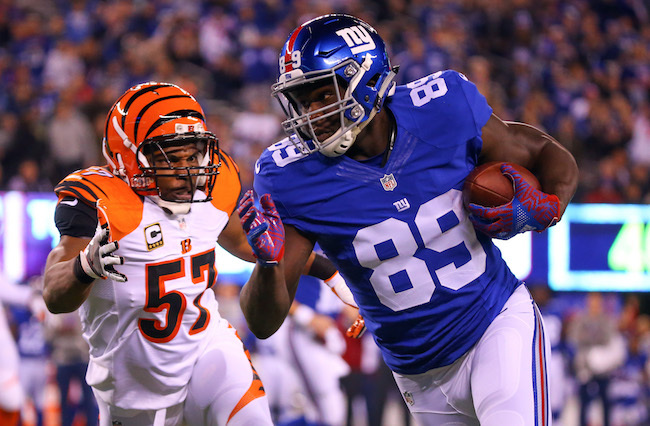 Officially, the Giants had 13 hits on quarterbacks, 10 pass defenses, and 7 tackles for a loss – all high totals. Not playing were fullback/tight end Will Johnson (burner), linebacker Jonathan Casillas (ribs), linebacker Jasper Brinkley (knee), linebacker B.J. Goodson (concussion), cornerback Leon Hall (concussion), and safety Darian Thompson (shoulder). 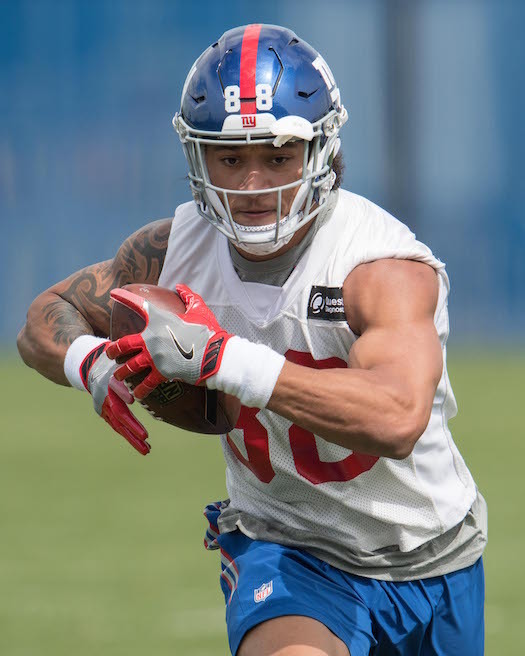 Fullback Nikita Whitlock (foot), tight end Matt LaCosse (knee), and tight end Ryan Malleck, who were waived/injured by the New York Giants earlier this week, passed through waivers and were added to New York’s Injured Reserve.